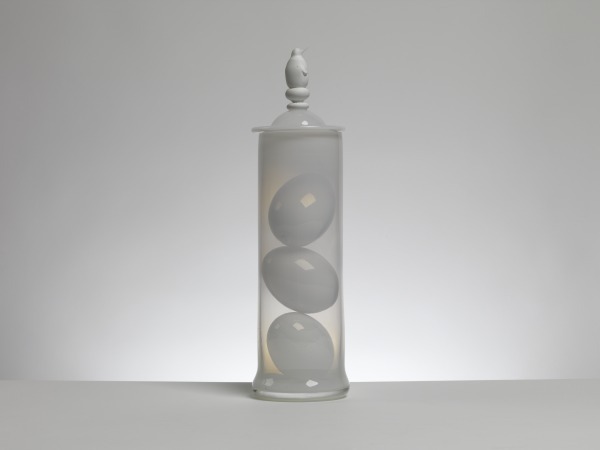 Free blown hot glass cylinder, free blown-lid, hot-sculpted detail, free blown glass eggs. All components were free blown. The Worst Journey in the World, James Maskrey, 2011, Crafts Council Collection: G102. Photo: Todd-White Art Photography. 'The Worst Journey in the World' is part of an evolving body of related artworks first conceived in 2009 that celebrate voyages of discovery, endeavour and exploration. These artworks have encompassed Darwin, Cook and the heroic age of Antartic exploration. Since 2006 my work has become more refined and although playful, somewhat more serious. These Antartic pieces are part of a series that I feel have found a voice and recognisable style.